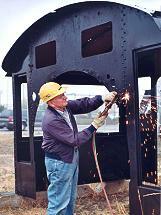 OCHR member Frank Wilcox sends out a shower of sparks as he makes a final adjustment in the cab prior to reinstallation on locomotive #104. 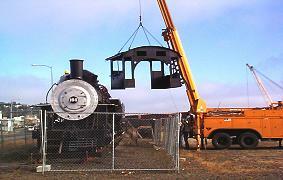 The crane truck from Pacific Power swings the cab easily up into position to set it down on the engine. Steady as she goes! 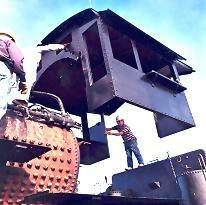 The cab is slowly lowered into position on the cab of #104. It was tight fit, but everything went back together just fine. 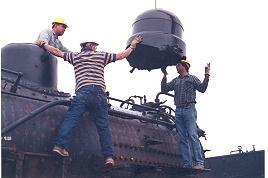 OCHR members and workers from Pacific Power make the final adjustments in positioning a sand dome atop #104. 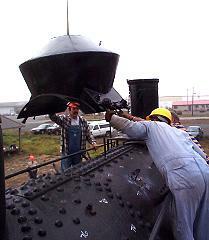 Members of the group steady the newly-refurbished steam dome atop locomotive #104.